This is a unique guide to obtaining the degree of Doctor of Philosophy of Law in the United Kingdom. It is readable and informative, drawing on interviews and case studies with PhD students, supervisors and examiners. Getting a PhD in Law is a unique guide to obtaining the degree of Doctor of Philosophy of Law in the UK. While there is a wide range of study guides for PhD students in the social sciences and other science-based disciplines, there is very little information available on the process of obtaining a PhD in law. Research degrees in law share some attributes with those in related disciplines such as the humanities and social sciences. However, legal methodology and the place of the PhD in law in the young lawyer's career create unique challenges that have not been addressed by existing guides. 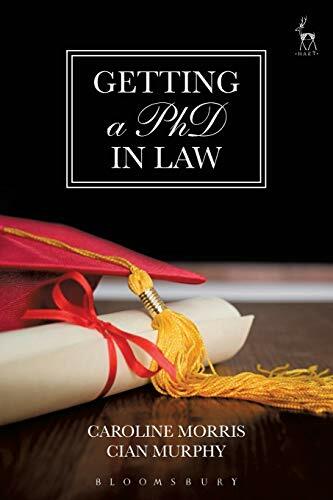 Getting a PhD in Law fills this clear gap in the market, providing an accessible guide to the PhD process from topic selection to thesis publication. This readable and informative guide draws on interviews and case studies with PhD students, supervisors and examiners. Getting a PhD in Law will be essential reading for the growing numbers of PhD students in the UK's many law schools-and those internationally who wish to learn from UK best practice.